Black high top chucks are so light on your feet that you can levitate in them! 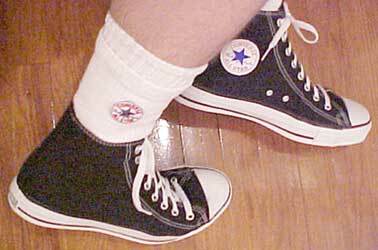 People who already wear and like Chuck Taylors know that they are light on your feet, are very flexible, and have that classic cool look. And now you can actually “float” in a pair. It would be unfair to reveal the secret in this article, but if anyone’s interested, you can purchase the instructions at a magic store or easily buy them on the Internet. Just do a search for Zero Gravity and you will find several on-line vendors to choose from. If you learn how to perform the levitation, have someone photograph you doing it, and send it to us at mail@chucksconnection.com. (attach any pictures in a jpeg file), and your picture will be posted with this article. It would be great to get some pictures of someone performing the illusion for the website.